Ooh, the Gallery was an easy one this week! The theme is 'Hands' and I immediately knew which photo I was going to use. 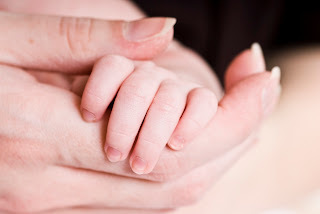 I take this kind of photo on every newborn shoot I do and there are others that are far better - technically speaking - than this one, but this one is of my daughter's hand in mine when she was only 7 weeks old. It was one of the first photos of her that we hung on the wall and I have it as one of my desktop images. Now hop on over to Sticky Fingers and take a look at the other entries. I have one like this. So precious. That is such a beautiful photo - it makes me feel very broody! I see that you didn't have to think about this theme either :) Lovely photo of yours too.